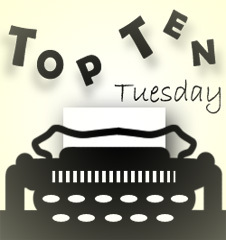 This entry was posted in to-read, Top Ten Tuesday. Good luck with your goal! There are some great books here! I think NIGHT GARDENER might get a Newbery nod, and possibly a look at the Printz for WE WERE LIARS? UNWIND has one of THE creepiest scenes I’ve read in YA!!! You’re braver than me…I won’t read the Rave Cycle until the final book is out. THOSE CLIFFHANGERS!!! I’m so excited to re-read TEARLING and then read the sequel! I’m also looking forward to the sequel for REBEL BELLE. Ahhh, and THRONE OF GLASS, SHADOW AND BONE, and GRAVE MERCY are all so great! I hope you love them all! You have some GREAT reading ahead! For my TBR this winter…hmm, I’d really like to read the first two books in Melissa de la Cruz’s series on a snowy day!! And FAIREST next week! That’s cool that your family has read Unwind–that’s a series I need to get to reading as well. The premise was just so intriguing to me! I do wish you all the best with We Were Liars. I seem to be part of the minority who had a strong dislike for it haha. I’m behind on a lot of series. I’ve decided to try and catch up this year though. I’ve read all the (currently out) books in The Lunar Chronicles and I’m currently reading Laini Taylor’s trilogy (loving the first one, Daughter of Smoke and Bone). I need to read more by Maggie S too!